Allen Hall Seminary in Chelsea offer comfortable rooms in central London in July and August. Beautiful gardens and chapel. Rooms from £50 per night (including breakfast). Website: www.allenhall.org.uk; email: allenhall@rcdow.org.uk or telephone: 020 7349 5600 (option 0). Next weekend we welcome a choir from the Royal Schools of Church Music to the evening Mass on Saturday. Figures not available this week at time of publication. In 2017, the SVP celebrates the 400th anniversary of the beginning of St Vincent de Paul’s ministry with the most disadvantaged people, which inspired the foundation of our Society. The Carlisle District of the SVP will celebrate a Mass of thanksgiving at St Augustine’s on Saturday 9 September at 10.00 am. Afterwards there will be light refreshments in the social room there. Parishioners are welcome to be part of this occasion. The Cor et Lumen Christi community invite women to be refreshed in the Living Water and experience the renewing love of God. Donation only event. It will take place on Saturday 9 September at St Cuthbert’s, The Old Convent, Wigton CA7 9HU. See the poster in the foyer. To book or for more information, visit www.coretlumenchristi.org, phone 016973-45623 or 07516-075896 or email stcuthberts@coretlumenchristi.org. There will be a morning Recollection at St. Margaret Mary on Saturday 7th October beginning at 10.00 am - the theme will be ‘Mary - seat of Wisdom’. It is hoped to have one recollection every half term in the parish. 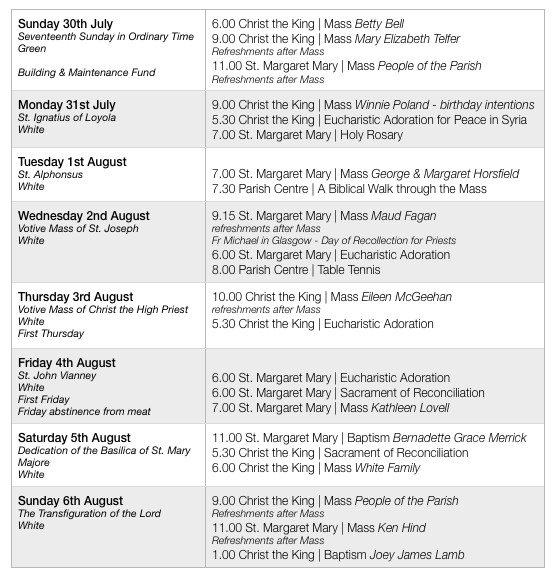 On Friday 13th October, to mark the final apparition of Our Lady at Fatima, there will be a torchlit rosary procession in the evening at St. Margaret Mary. The annual diocesan pilgrimage to the shrine of Our Lady of Lourdes at Cleator will take place on Sunday 10th September, with Mass at the Grotto at 3.00 pm. It would be good for the parish to attend, particularly young families. We will provide a bus to enable attendance of as many people as possible. Please consider coming along - sign up sheets are at the back of both churches. As usual the young people are invited to walk in pilgrimage from Honister across Haystacks into Ennerdale then onto Cleator. They will begin their journey at Castlerigg Manor on Friday 8th September. The event is a great opportunity to make new friends and to triumph over a physical challenge. 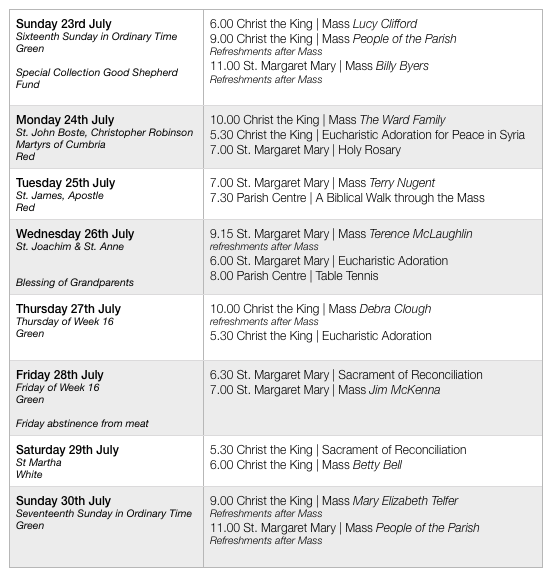 The walk is about 10 miles each day and concludes with the diocesan Mass at Cleator at 3.00 pm. Age 16+ Young people can register their interest in joining the walk by contacting Fr John at Castlerigg - tel. 017687 72711. With the good news that Newman Catholic School will be relocating to a new site with a brand new school within the parish, comes the news that we have been asked to contribute, as a parish, to the creation of a new chapel for the school. We have been asked to raise £9,000 towards a total of around £70,000. The figure may seem a lot but its do-able with some prayer and effort - with God’s help anything is possible. More on this in the Autumn. Tuesday night parish catechesis continues this Tuesday in the Parish Centre at St. Margaret Mary from 7.30 pm. The next unit of study focuses on the Mass in Scripture. Please consider coming along - all are welcome. Thanks to all who attended the ‘Curry Night’ on Wednesday evening in the parish centre. Thanks especially to those who helped organise the very successful event, which raised £500. On Wednesday, we celebrate the Memorial of Sts Joachim and Anne - the grandparents of Jesus. Grandparents are invited to come along to Mass on Wednesday morning for a special blessing - bring your grandchildren along with you! This year falls on Sunday. On Saturday 5th August we welcome a choir from the Royal Schools of Church Music during the evening Mass. 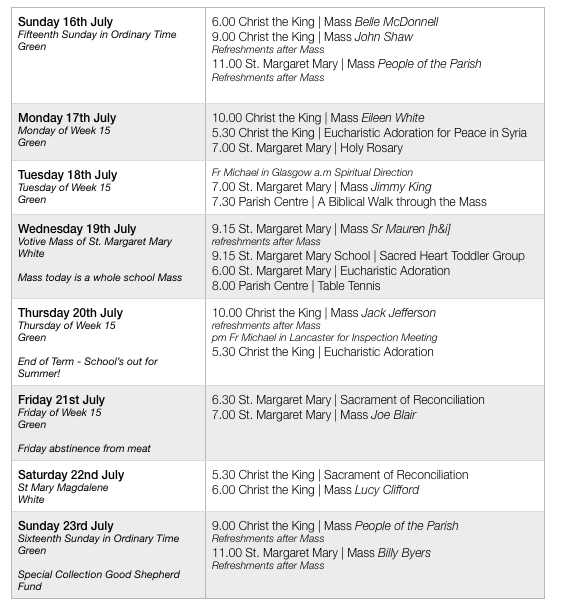 Offertory and Figures for last weekend. There were 58 + 59 + 123 = 240. Thank you for your offertory contribution of £457.32 + £182.90 = £640.22. Researchers at Coventry and Leicester universities are working with Christian charities Restored and Churches Together in Cumbria to carry out the first major UK study of Church responses to domestic abuse. The study will collect vital data that will inform the training provided to churches. We invite everyone – whatever your gender or experience of this issue - to take part in the research. The research has received ethical approval. Participants’ confidentiality and anonymity will be assured: the church won’t be named and we don’t require your name or contact details. To complete the survey online visit https://coventry.onlinesurveys.ac.uk/domesticabuse. In 2017, the SVP celebrates the 400th anniversary of the beginning of St Vincent de Paul’s ministry with the most disadvantaged people, which inspired the foundation of our Society. The Carlisle District of the SVP will celebrate a Mass of thanksgiving at St Augustine’s, on Saturday 9 September at 10.00 am. Afterwards, there will be light refreshments in the social room. Parishioners are welcome to be part of this occasion. The Cor et Lumen Christi community invite women to be refreshed in the Living Water and experience the renewing love of God. Donation only event. On Saturday 9 September at St Cuthbert’s, The old Convent, Wigton CA7 9HU. See the poster in the foyer. To book or for more information, visit www.coretlumenchristi.org, phone 016973-45623 or 07516-075896 or email stcuthberts@coretlumenchristi.org. Street Pastors is an international, but primarily UK, Christian organisation whose motto is Listening, Caring and Helping. We go onto the streets of the city between 10.00 pm and approximately 3.00 am on a Saturday night and offer help to anyone who may need it. This help could include flip flops for women with sore feet, simple first aid, helping people to taxis or just simply a listening ear. Each person goes out once a month only and we operate in groups of three of four. Street Pastors in Carlisle are anxious to recruit new members. For more information, please contact the Area Coordinator, Kathy Howe, Howe kathyhowe07@gmail.com. Meets in Penrith on Tuesday 25th July at 8.00 pm. Tuesday night parish catechesis continues this Tuesday in the Parish Centre at St. Margaret Mary from 7.30 pm. The next unit of study focuses on the Mass in Scripture. Please sign up to enable resources to be ordered. Please consider coming along - all are welcome. Many thanks to all who have supported this assistance to local families - your help is greatly appreciated. The balcony at St. Margaret Mary does not comply with current building regulations. It is proposed to bring down the altar rails which currently serve as a type of bannister and to restore them to the sanctuary [it seems a shame to dispose of them]. A new bannister will be fitted to comply with regulations. Website: www.allenhall.org.uk; email: allenhall@rcdow.org.uk telephone: 020 7349 5600 (option 0). Catholic Singles is an organisation which helps single Catholics of all ages (over 18 years) meet other single Catholics, either one to one or through social events. For further information, please visit www.catholicsingles.org.uk or tel. 0161 941 3498. Participants’ confidentiality and anonymity will be assured: the church won’t be named and we don’t require your name or contact details. To complete the survey online visit https://coventry.onlinesurveys.ac.uk/domesticabuse. All help is greatly appreciated. The Carlisle District of the SVP will celebrate a Mass of thanksgiving at St Augustine’s, on Saturday 9th September at 10.00 am. Afterwards there will be light refreshments in the social room there. Parishioners are welcome to be part of this occasion. The Cor et Lumen Christi community invite women to be refreshed in the Living Water and experience the renewing love of God. Donation only event. Saturday 9th September at St Cuthbert’s, The old Convent, Wigton CA7 9HU. See the poster in the foyer. To book or for more information, visit www.coretlumenchristi.org, phone 016973-45623 or 07516-075896 or email stcuthberts@coretlumenchristi.org. Street Pastors is an international, but primarily UK, Christian organisation whose motto is Listening, Caring, and Helping. We go onto the streets of the city between 10.00 pm and approximately 3.00 am on a Saturday night and offer help to anyone who may need it. This help could include flip flops for women with sore feet, simple first aid, helping people to taxis or just simply a listening ear. Each person goes out once a month only and we operate in groups of three of four. Street Pastors in Carlisle are anxious to recruit new members. For more information, please contact the Area Coordinator, Kathy Howe, on kathyhowe07@gmail.com.